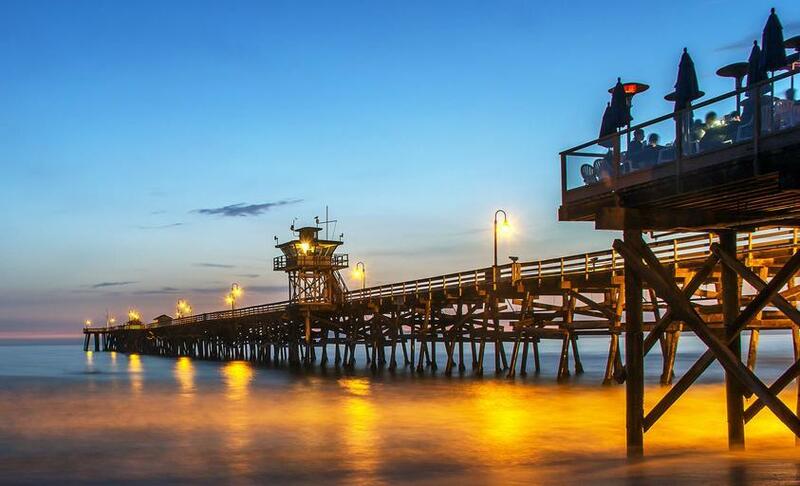 San Clemente in California is a small city on the Pacific Coast Highway midway between San Diego and Los Angeles, noted for its beaches, surfing, and Spanish colonial-style architecture. San Clemente's city slogan is 'Spanish Village by the Sea', and like Santa Barbara it's a pretty place to walk around, with lots of its houses, shops, restaurants, and other buildings having cream stucco walls, red-tiled roofs, and windows and doors using dark woods, in Spanish style. With average traffic it should take about an hour to drive to San Clemente from San Diego, and a little more from Los Angeles because of the heavier traffic. You can take either the Pacific Coast Highway along the coast, or I-5, which also runs through the city. 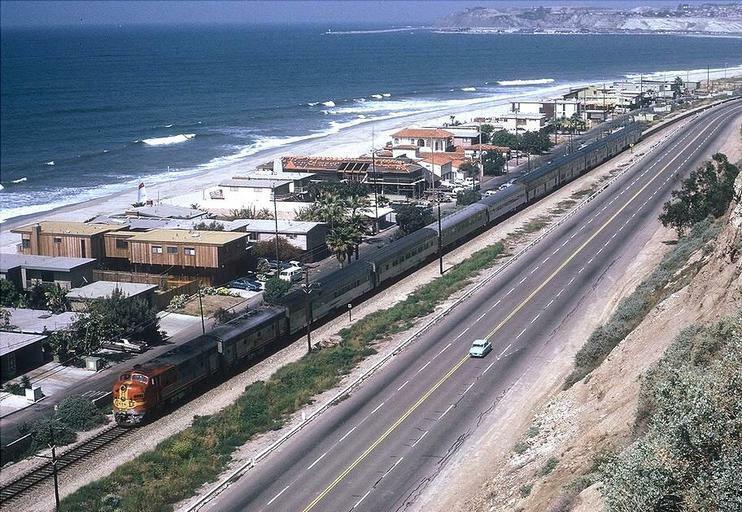 You can also take the Amtrak train from either San Diego or Los Angeles to San Clemente, and the city has two stations, including one right by the pier. You might want to think about taking the train, to avoid the hassle of traffic and parking. San Clemente has an almost perfect climate, so any time of year is a good time to visit. You might want to avoid February, when it gets about 1/3 of its annual rainfall, but even that month only sees just over 3" (76mm). There's hardly any rain from May to October. It averages 310 sunny days a year. December is the coldest month with average highs of 67F (19C) and average lows of 49F (9C). In August you can expect average highs of 87F (31C) and average lows of 61F (16C). Casa Romantica was built in 1927 as a home for the founder of San Clemente, a real-estate developer named Ole Hanson. It was Hanson who said he wanted the town to be a Spanish Village by the Sea, and his own home was designed in the same style. Today it's the Casa Romantica Cultural Center and Gardens. You can tour the house, which is on the National Register of Historic Places. You can also enjoy the gardens, of which there are thirty different ones including a Butterfly Garden, Native American Garden, and a Children's Garden. There's also a wide range of activities, including yoga workshops, poetry workshops, wine tastings, and live concerts, so if you're visiting San Clemente, check out their events calendar. San Clemente has its own Municipal Golf Course. In addition, in the hills above the town, there's the Talega Golf Club. This has an 18-hole championship course which has been voted one of the best in the USA, plus a driving range, a restaurant, and its buildings are in the attractive Spanish Colonial style. There's a pleasant walk or bike ride to be had along the San Clemente Beach Trail. It's dog-friendly too, offers some great views along the way and runs for 2.3 miles (3.7 kms). Unlike, say, Santa Monica Pier, there's not a lot to do on San Clemente Pier other than walk along it, enjoy the views from one of the benches, and maybe dine or have a drink at one of the eating places. It's still a lovely pier, though! 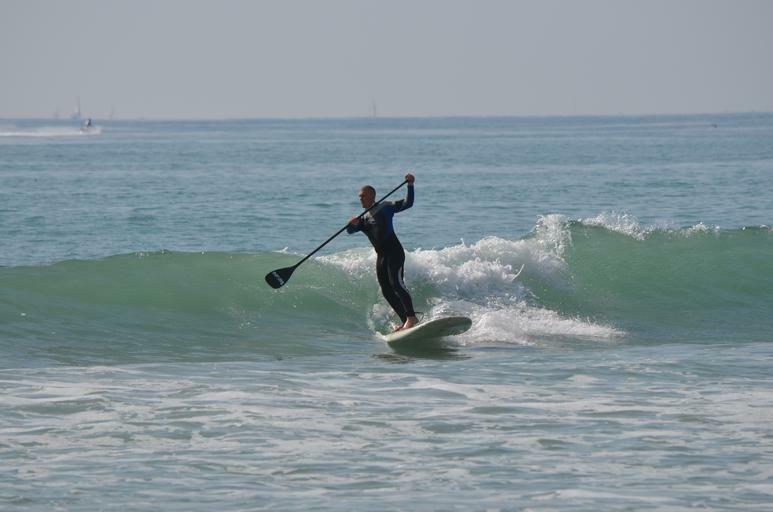 Yes, now's your chance to learn to surf, and the fact that they're open all year round tells you something about the San Clemente weather. Despite Huntington Beach calling itself Surf City, San Clemente also has a right to claim the title. It has numerous surfing beaches, surfing shops, and surfboard manufacturers. It publishes no fewer than three different surfing magazines, has a surfing museum (see below), and it's also home to several champion surfers. This free museum (donations welcomed, of course) has a huge collection of photos, videos, surfing memorabilia, surfboards, posters, clothing, magazines, and books about surfing from all over the world. One notable San Clemente resident was President Richard Nixon, who lived here from 1969-1980. His home was dubbed the Western White House, and it's where he wrote his memoirs after leaving the presidency. Visit the official San Clemente Travel Guide website.